This document details feature columns. Think of feature columns as the intermediaries between raw data and Estimators. Feature columns are very rich, enabling you to transform a diverse range of raw data into formats that Estimators can use, allowing easy experimentation. In Premade Estimators, we used the premade Estimator, tf.estimator.DNNClassifier to train a model to predict different types of Iris flowers from four input features. That example created only numerical feature columns (of type tf.feature_column.numeric_column). Although numerical feature columns model the lengths of petals and sepals effectively, real world data sets contain all kinds of features, many of which are non-numerical. Some real-world features (such as, longitude) are numerical, but many are not. So, although raw data can be numerical or categorical, an ML model represents all features as numbers. As the following figure suggests, you specify the input to a model through the feature_columns argument of an Estimator (DNNClassifier for Iris). Feature Columns bridge input data (as returned by input_fn) with your model. Feature columns bridge raw data with the data your model needs. Feature column methods fall into two main categories and one hybrid category. Dividing year data into four buckets. Why would you want to split a number—a perfectly valid input to your model—into a categorical value? Well, notice that the categorization splits a single input number into a four-element vector. Therefore, the model now can learn four individual weights rather than just one; four weights creates a richer model than one weight. More importantly, bucketizing enables the model to clearly distinguish between different year categories since only one of the elements is set (1) and the other three elements are cleared (0). For example, when we just use a single number (a year) as input, a linear model can only learn a linear relationship. So, bucketing provides the model with additional flexibility that the model can use to learn. # First, convert the raw input to a numeric column. # Then, bucketize the numeric column on the years 1960, 1980, and 2000. Note that specifying a three-element boundaries vector creates a four-element bucketized vector. A categorical identity column mapping. Note that this is a one-hot encoding, not a binary numerical encoding. # assigned to 'my_feature_b' must belong to the set [0, 4). Mapping string values to vocabulary columns. Representing data with hash buckets. 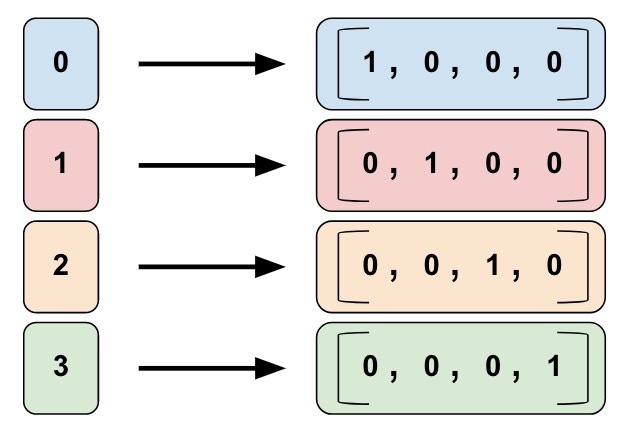 Combining features into a single feature, better known as feature crosses, enables the model to learn separate weights for each combination of features. More concretely, suppose we want our model to calculate real estate prices in Atlanta, GA. Real-estate prices within this city vary greatly depending on location. Representing latitude and longitude as separate features isn't very useful in identifying real-estate location dependencies; however, crossing latitude and longitude into a single feature can pinpoint locations. 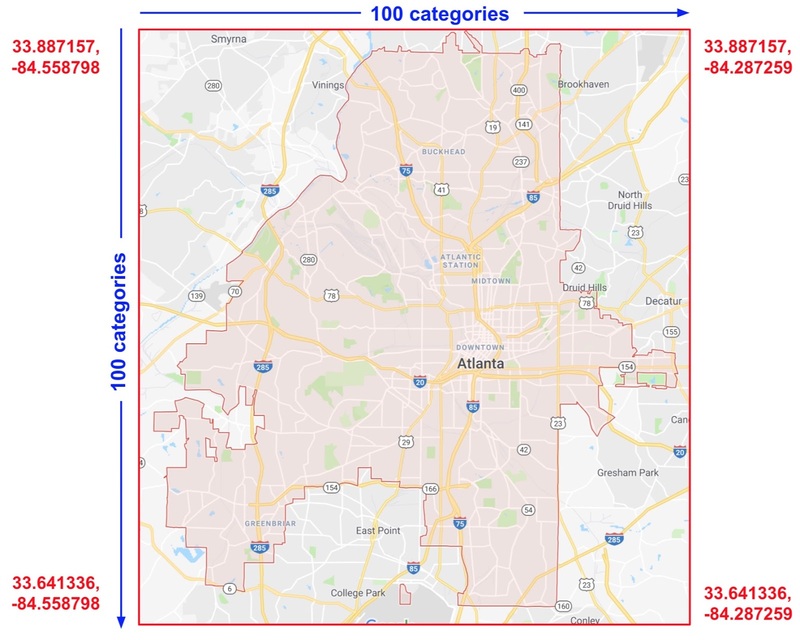 Suppose we represent Atlanta as a grid of 100x100 rectangular sections, identifying each of the 10,000 sections by a feature cross of latitude and longitude. This feature cross enables the model to train on pricing conditions related to each individual section, which is a much stronger signal than latitude and longitude alone. Map of Atlanta. Imagine this map divided into 10,000 sections of equal size. For the solution, we used a combination of the bucketized_column we looked at earlier, with the tf.feature_column.crossed_column function. # Cross the bucketized columns, using 5000 hash bins. # Build and train the Estimator. Feature names; that is, names from the dict returned from input_fn. 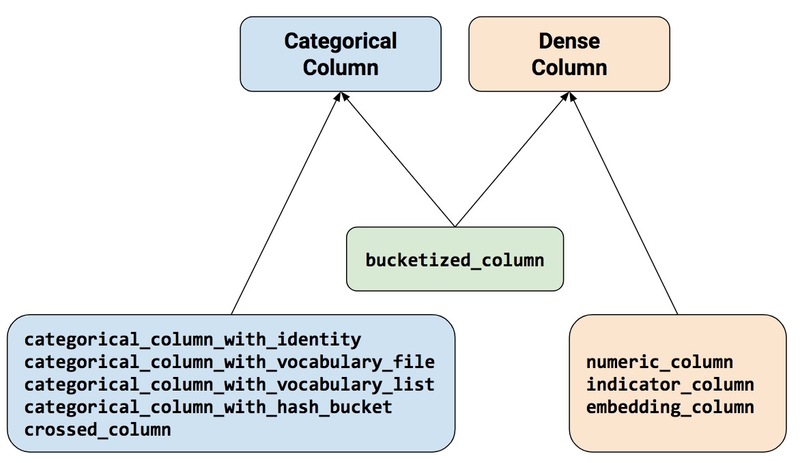 Any categorical column, except categorical_column_with_hash_bucket (since crossed_column hashes the input). Except that a full grid would only be tractable for inputs with limited vocabularies. Instead of building this, potentially huge, table of inputs, the crossed_column only builds the number requested by the hash_bucket_size argument. The feature column assigns an example to a index by running a hash function on the tuple of inputs, followed by a modulo operation with hash_bucket_size. As discussed earlier, performing the hash and modulo function limits the number of categories, but can cause category collisions; that is, multiple (latitude, longitude) feature crosses will end up in the same hash bucket. In practice though, performing feature crosses still adds significant value to the learning capability of your models. Somewhat counterintuitively, when creating feature crosses, you typically still should include the original (uncrossed) features in your model (as in the preceding code snippet). The independent latitude and longitude features help the model distinguish between examples where a hash collision has occurred in the crossed feature. Indicator columns and embedding columns never work on features directly, but instead take categorical columns as input. Representing data in indicator columns. categorical_column = ... # Create any type of categorical column. Now, suppose instead of having just three possible classes, we have a million. Or maybe a billion. For a number of reasons, as the number of categories grow large, it becomes infeasible to train a neural network using indicator columns. We can use an embedding column to overcome this limitation. Instead of representing the data as a one-hot vector of many dimensions, an embedding column represents that data as a lower-dimensional, ordinary vector in which each cell can contain any number, not just 0 or 1. By permitting a richer palette of numbers for every cell, an embedding column contains far fewer cells than an indicator column. In that case, the following figure illustrates the processing path for embedding columns or indicator columns. As an indicator column. A function converts each numeric categorical value into an 81-element vector (because our palette consists of 81 words), placing a 1 in the index of the categorical value (0, 32, 79, 80) and a 0 in all the other positions. As an embedding column. A function uses the numerical categorical values (0, 32, 79, 80) as indices to a lookup table. Each slot in that lookup table contains a 3-element vector. How do the values in the embeddings vectors magically get assigned? Actually, the assignments happen during training. That is, the model learns the best way to map your input numeric categorical values to the embeddings vector value in order to solve your problem. 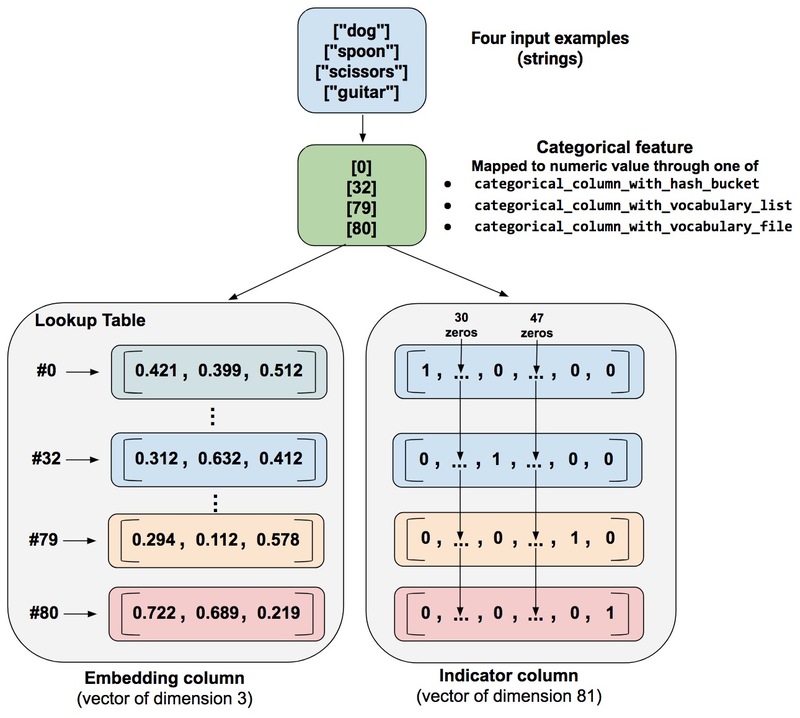 Embedding columns increase your model's capabilities, since an embeddings vector learns new relationships between categories from the training data. Note: This is just a general guideline; you can set the number of embedding dimensions as you please. # This means creating an embedding vector lookup table with one element for each category. Embeddings is a significant topic within machine learning. This information was just to get you started using them as feature columns. tf.estimator.LinearClassifier and tf.estimator.LinearRegressor: Accept all types of feature column. tf.estimator.DNNClassifier and tf.estimator.DNNRegressor: Only accept dense columns. Other column types must be wrapped in either an indicator_column or embedding_column. The linear_feature_columns argument accepts any feature column type. The dnn_feature_columns argument only accepts dense columns. The Low Level Introduction demonstrates how experiment directly with feature_columns using TensorFlow's low level APIs. The Estimator wide and deep learning tutorial solves a binary classification problem using feature_columns on a variety of input data types.